A Club for those interested in wild mushrooms in Western Massachusetts and adjoining areas of Connecticut and New York. The late, great Professor McGinty started our club, in 1923. Right before his death at the age of 101 in the year 2000, he found and photographed the elusive "Berkshire Blue" amanita. His disciples have helped the organization grow into the small and disheveled club that it is today. Maybe one day we will even get non-profit status and become official, but I doubt it, because none of us really care about that. Right now we are more of a loosely formed autonomous collective. Most of us are obsessively devoted to the task our master assigned us before he departed- to again find and collect the famous blue amanita of the Berkshire Hills! Meetings- Now and then on Fridays of some months at 4:30 PM at the Barrington Brewery, because of the free food that comes out right around then.. However, it's been a few years, so this guy Tom and his old friends have taken over our table, and we might have to have an old fashioned rumble, jets and sharks style, with some cantankerous geriatric gentlemen in order to get our table back. Maybe we should just meet at 20 Public House so I can get a good Manhattan. What you choose to put into your mouth is not our responsibility. 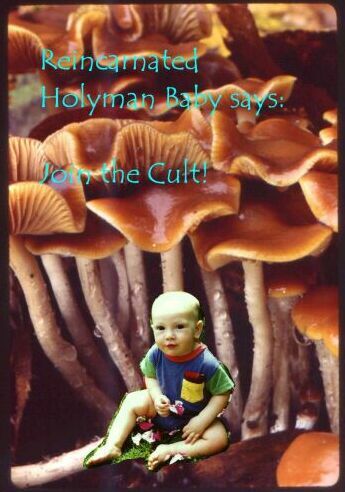 The Reincarnated Holyman Baby owes his great achievements to a diet rich in mushrooms. Once you give him all your money and the deed to your house, you too shall know eternal happiness. This is really what we do. We pick and identify mushrooms. We meet at various places at 10 AM every Sunday during the mushroom hunting season to gather mushrooms. Usually, we will meet again at 12 noon after 2 hours of picking to identify and compare what we have found. All are welcome to attend. Children are especially welcome, dogs are discouraged. Tigers are not allowed at all. Elephants are only allowed with a parade permit. If you are interested in more information please read the FAQ page. There is a link to the FAQ page at the top of this page. Bring us the broomstick of the Wicked Witch of the West and we MIGHT let you join. Huge cash gifts have been known to effect our decision making process. The initiation ritual not only involves secret handshakes and chanting, but is also quite painful and, on occaision, fatal. 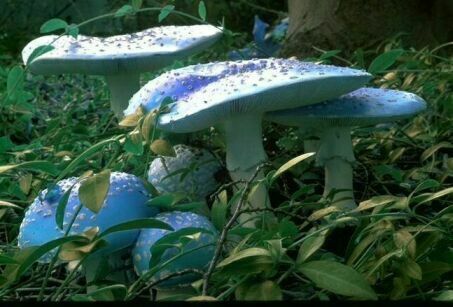 This photograph was taken by the Late Professor McGinty, the only person ever to have found the infamous "Berkshire Blue" Amanita. While a handful of angry, bitter, and misguided mycologists believe that this is a fraudulent picture, most of the elite mycologists of the world eventually make a pilgrimage to the Berkshires to walk the same woods frequented by the late, great Mcginty, with hopes of finding this elusive mushroom for themselves.